Every weekend this month we have been spending at the trailer park. Sometimes this can be very exciting and fun for my two pups and sometimes these means a dull weekend inside the cottage mostly. It is really hard because the trailer park is still under construction and some weekends it is just not safe to have them out and running about. We try to take them on lots of walks through out the day so they are not alone and just sleeping all day. I got two active dogs because we are active people and wanted dogs to be active with. I feel so bad when I have to go to the store and work and my fiance has things to do as well and she watches us walk away out the window. We are going to be opening a dog park soon up there and I can't wait. It is going to be right next to the store so they can be out playing all day and I can visit with them any time the store is empty. At least they are both super happy up there even if it is just for long walks every so often for now. we got so lucky with our two pups and they are such a big part of our family now. I love my little fur family and they are just that, part of our family. Every weekend we make sure to all go out as a big family and go to the lake by us for a walk. It keeps us all active and the dogs love it over there with all the people. Both our dogs are all about getting attention and it is so cute to watch them as people approach us. Their tail/bum will shake with excitement and their eyes light up. Our youngest little boy is adorable, it seems he has discovered who the best targets are for getting a few pats out of people. A young couple walk by us just a bit of excitement but it's like he knows they wont pet him, then an old lady walked by... Well now he can barely keep still. He starts to wiggle he is so excited which makes everyone laugh and always ends with him getting pet. On the rare occasion that someone walks by without giving them even a little bit of attention you can see them look down as if upset. I guess we spoil our dogs and it shows. I don't mind one bit. I will continue. Look at those cute little faces of excitement and try turning them down. The cottage is a place we spend much of the summer weekends at. Our cottage is in the middle of no where and a great place to kick back and enjoy. For our dogs it is a place to run free and explore. Last year was the first year we ever took our first dog Sky to the cottage. I was nervous at first because I did want to be able to let her off leash so she could fully enjoy herself but did not want her getting into trouble. It was a complete success last year. Sky is the type of dog that will do anything and everything to please you. She is extremely smartand very loyal. She stuck by our sides most of the time at home and being at the cottage turned out to be no different. We spent the first few times up there showing her around and teaching her the boundaries of her freedom. She learned them quickly. She was a bit of a nervous dog so many things scared her at the cottage and took time for her to get used to but she was never much of an explorer. By the end of the summer last year she was jumping in and out of the lake with ease and bounding about the property and getting to know the few neighbors we had. It was enjoyable to watch her be the country dog she was meant to be and to see her so happy up there. It was also nice to have the peaceful sleepy dog for days after being up at the cottage. This year we have a new addition to the family, Ziggy. He is very naughty and curious. He is extremely smart but also very independent. He wants you to be happy with his actions but he is not there to please you like Sky is. He will listen if he feels it falls under what he would like to do. He is very much going through some teen "whatever" faze. Needless to say my nerves about bringing him up to the cottage was through the roof. I figured he would explore too much and get himself into a lot of trouble. This past weekend we had to go up to the cottage so I braced myself for the worse. Wow I could not have been more wrong. He was supper attentive to the rules and boundaries of the cottage. He became scared of the things I thought he would want to explore. It turns out he is going to be just fine up at the cottage. Now I can spend this summer doing as I did with Sky last year, helping him explore and discover. Ok so yes he is a supper exploring puppy and did more then Sky ever did in his first weekend but he was also supper scared of the things I kind of wanted him to be scared of so he would stay safe. I can't wait to explore with him this year and watch him as he discovers the cottage. I hope he too will soon be bouncing in and out of the water and playing with Sky too. Today's society is all about connecting it seems. You can talk to people half way around the world through twitter and other social networks. It is great and all but it still keeps up staring at a screen talking to someone we will possibly never actually meet. Don't get me wrong I love the conversations and the people you can meet this way but some times you need to get out and have verbal conversation with someone. Most recently I found a website, which of course also has an app where you can meet people of like interests. It is called Meet ups. You go to the site and you are able to look for people based on location and interests. Each group will have a coordinator which will work out a location and or activity for the whole group to do. At first yes these people are complete strangers to you but with each meet up you can make some new great friends who like to do the same kind of thing as you. Maybe you have always wanted to try bungee jumping but none of your friends will go with you. Well then you may never do it. Well go on meet ups and find a group that are going. It really is that simple. 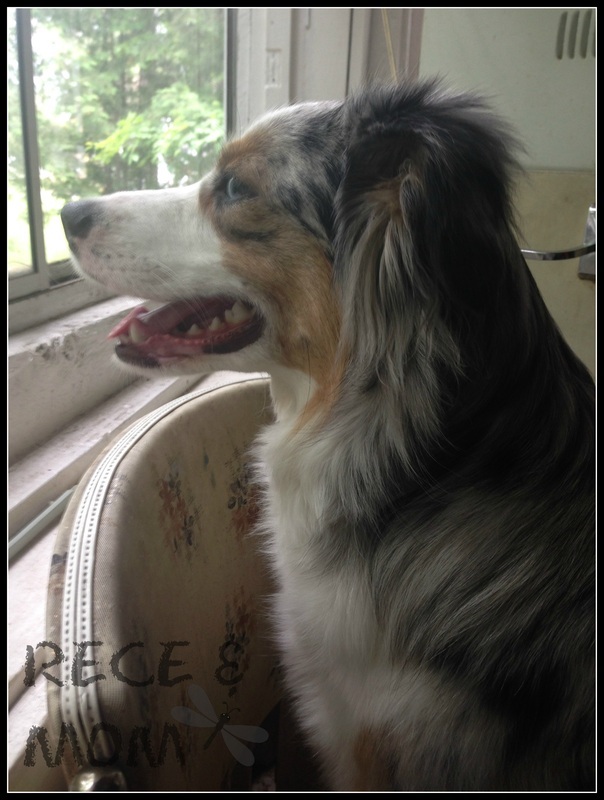 I as you may have seen through my many pictures have two adorable little Aussie shepherds. Well no one else in my group of family or friends have dogs. 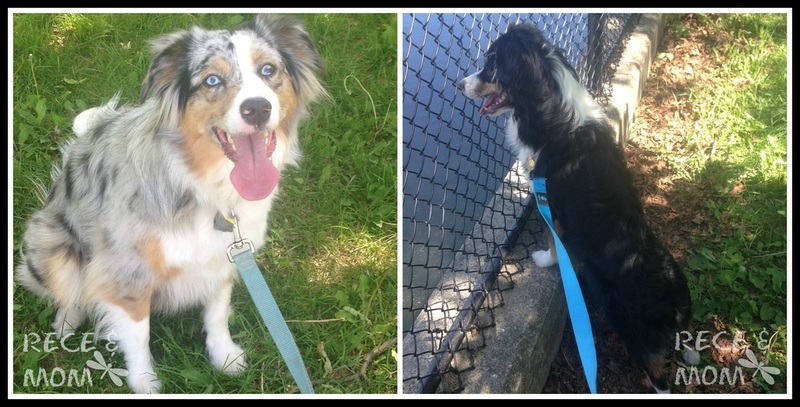 Then I went on this site and not only did I find other people who have dogs but I found a Aussie shepherd meet up group. Being able to get my dogs together with similar dogs was great. It was also a great experience as this was my first time owning dogs so I got chat and ask questions to people who had the same issues as me because they had the same type of dogs. They have so many different types of groups I can say 100% there is a group out there for you no matter your interests. I know a few times I have talked about how having a puppy is very similar to having an infant, some of you may agree and some may not. Well I have one more example of how my little pup is for now my little new born baby. As I am sure we are all so pleased to see the snow is melting away revealing spring, also known as a very muddy wet time of year. After having so much snow and cold I am happily welcoming the wet and mud. I am sure this feeling will only last for a little while till its daily baths for the dogs. For now I shall enjoy the mud and wet as the snow in my backyard slowly fades away to reveal the ground that has been hiding for so long. Our newest little one came from up north and so even when we brought him home he was very used to the snow and cold. His first weekend home was not too cold but soon after the snow came and until now has not left our backyard. Needless to say our little one was "snow trained." He knew where to go pee, in the snow. He knew where to play outside, in the snow. Now the snow is leaving us and I thought this minor change would not affect him at all as he has seen grass before when he was very tiny. Well it seems as if he does not remember what it is like to have grass. I wake up every night to take him out pee and with ease he heads rights out to the snow and goes pee then comes bounding back inside to go back to bed. This night something was different. 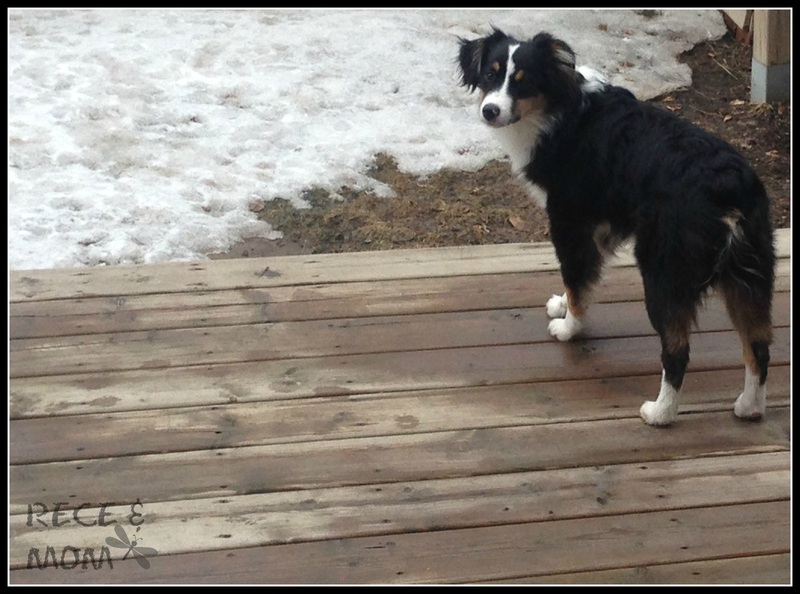 He ran to the edge of the deck, stopped and began to whimper. I went out to see what was wrong and I saw nothing. I looked everywhere for what might be bothering him but there was nothing. I finally went off the deck and called him down to me. I could tell he needed to pee but just seemed unsure and did not want to come off the deck. Finally he took a running leap from the deck and landed on the snow we did have left out back. The jumping continues. He has yet to walk in the mud as of yet. We have a few stepping stones and he now uses those to find his way out to the snow. Soon he will have to venture into the mud and find a whole new place to play. Like a mother watching her child discover something for the first time I am enjoying the little things like watch our little Ziggy hoping like a bunny to avoid the mud something he has yet to fully discover. With all this rain lately I now will have two very muddy dogs in and out of my house several times a day. I swear I clean but you would never know by looking at the back door area. I used to have a dog bed at the back door but then it was too much to wash that all the time. 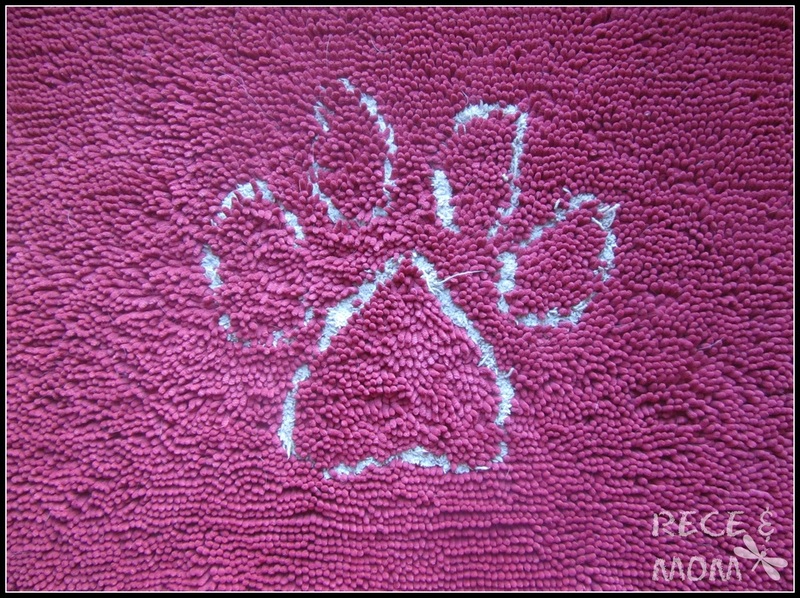 Then I started to just put down a towel so when it got dirty I could just put down another one easy enough. Sometimes when the weather was wet enough I would end up with several towels in the laundry at the end of the week. I was getting a little sick of the extra loads of laundry so I kept looking for a better solution. Well I found it and every dog owner in the world needs to go out right now and get one for themselves. It is a cute little mat that looks just like a little shag rug but is super absorbent. When I had the towel down it was there to protect my floor but I would still have to wash their feet before they could go anywhere, which is the part I was starting to dislike. With this new little mat I did not need to even wash their feet. I just would get them to lay down for a few minutes and then they were dry and any mud that was on them now was dry and would just wipe off easily. It is a must have and I can't explain it better then just saying you have to see how it works with your own dog or even muddy shoes on your kids. My dogs are not just pets to me. They are my "fur babies" and are a huge part of the family. When we got our first pup last year I wanted to do a lot of research into finding the right food for her. I found it so daunting. Depending on the site I would go to or who I was talking to each option seemed to be different. Finally after talking everyone's ear off at every pet store I decided on the brand. Our little girl was pleased as could be to eat her new food once we slowly switched her over to it. We had found a food she enjoyed and it never broke the bank when we had to buy it. All was going well. Then out of no where she stopped eating and we started to get really worried. If we put the food down she would just sit and look at it, not even take one bite. Something was very wrong. I tried hand feeding her and she would eat a bit but I could tell by the look in her eyes she was only doing it to make me happy she did not want to eat at all. When it came time for training she would do anything for that next treat and when we would give her a treat she would swallow it whole. She was hungry. Then we tried putting her treats in with her food. This helped for a little while. Someone said we should try a new food so we did and well she started to eat again. We thought we were in the clear and she ate for a month or two. Then she started to have loose bowel moments and it was pretty bad. We were up in arms what to do. The vet suggested a rice diet for a little while to get her back on track and so we did that. After about a week or two of that she was back to eating her new food again and all was well. Then she stopped eating again and I was at a loss. She went through the same thing of refusing food but still showing signs of hunger. This is when I reached out to everyone again and found a few new people along the way. One person told us about this one food that allowed you to switch flavors each time you got a new bag and I thought that might help our picky girl. I also then found out about the grading level for dog foods and this is what shocked me the most. All this time I was looking for grade A food thinking that was the best I could do for our girl, but sadly it is not. Grade A although it is pretty good it is still only rated as grade A dog food, there is a rating above that. The rating above is called human grade. Basically it is good enough for you or I to eat. It is the quality you get at a grocery store where as grade A is below anything they could sell at a grocery store. I was shocked. I finally found a human grade food that was sold at the local store, it is a decent price worth every penny and best of all like the man had told me I can switch flavors. Why would any dog want to eat the same thing for three meals a day for twenty years, why not offer up a change here and there. I am happy to say our girl has now gone about a year on the same food now and enjoys every meal and never ever turns down even one bite. Our second pup is now on the puppy version of the food which is what I have a picture of. I love this food and would urge any dog owner to try it out as well.